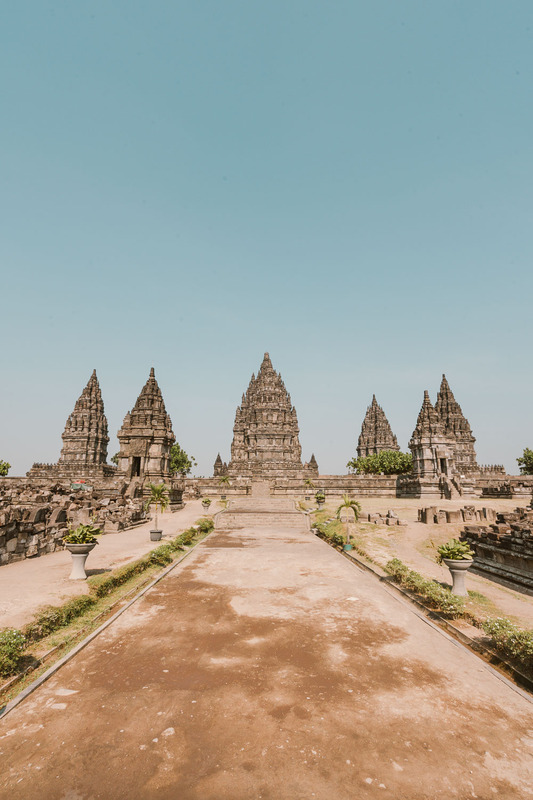 Yogyakarta is the cradle of civilization on the island of Java, Indonesia; and home to the ancient Buddhist and Hindu kingdoms, which have left temples that remain to this day, even though they have undergone volcanic eruptions, earthquakes and abandonment. Today the city, which is also part of the province known as the Yogyakarta Special Region, is ruled by the Sultan and is the only place in Indonesia ruled by a monarch. In addition, the destination plays an important role in Javanese culture, recognized for the production of batik (Indonesian dyeing technique), wayang (puppet show) and other Indonesian arts. 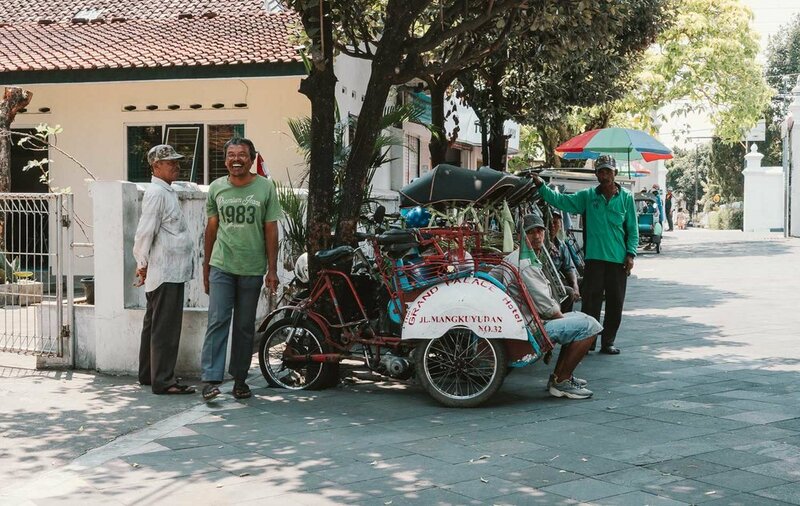 In Yogyakarta you will feel distant from the big city that it should be, as the place still maintains the light pace of a small city, as seen through the low-rise buildings and warungs (stalls) found at every corner. In addition, Yogyakarta has the highest HDI in Indonesia and here you will always find many young people, who come to the Province for the more than 100 universities, including the most famous in the country, where the current president, Joko Widodo, once attended. This post will show you what to do in Yogyakarta, with a combination of attractions and practical information to visit the most cultural city on the island of Java, Indonesia. One of Yogyakarta's most famous temples and one of the main attractions for anyone visiting the city, Borobudur is a 9th century Buddhist temple built as a place to glorify Buddha and for pilgrimage, guiding humanity from the world of desire to enlightenment, according to the teachings of Buddha. 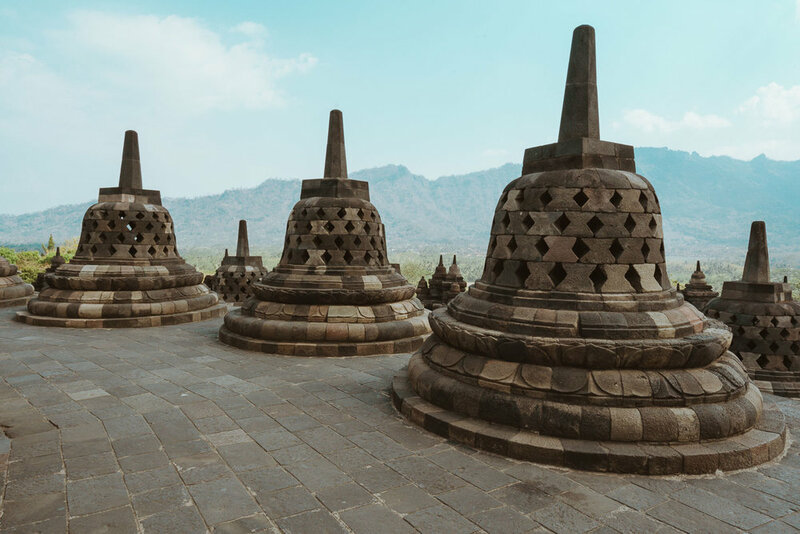 Borobudur has three levels which represent the Buddhist cosmology: the world of desire, the world of form, and the formlessness world - in which the person becomes enlightened. Pilgrims must pass through all levels to replicate the path to enlightenment, and along the way one can find reliefs depicting human desires and the life of Prince Siddhartha, from his birth to becoming the Buddha, as well as the famous stupas (bell-shaped towers) that may have a statue of the Buddhist master with different hand gestures (known as mudras) inside. Borobudur attracts visitors to see, mainly, the sunrise and the sunset. In the morning, the mist gives a mystical aspect to the experience, even more so as the sun rises in the company of the various Buddha statues. Admission costs US$ 25 (approximately 380,000 IDR) or 450,000 IDR for the sunrise (the latter is more expensive as it is necessary to go through the private property of a hotel); and can also be purchased in conjunction with the ticket to visit the Prambanan temple (US$ 40 - approximately 600,000 IDR). The opening hours are from 6 am to 5 pm, but people with a sunrise ticket normally arrive before operational hours, at 4:30 am. Within the complex you will also find restaurants, elephant rides and stalls to buy souvenirs. Also built in the 9th century, Prambanan is a Hindu temple dedicated to the god Shiva. Within the complex you will also find several other temples, with Shiva’s being the biggest of all, and nearby temples of Brahma and Vishnu; and additional minor ones, with some of them dedicated to the sacred animals that carry the Hindu gods (Nandi, Garuda and Hamsa). 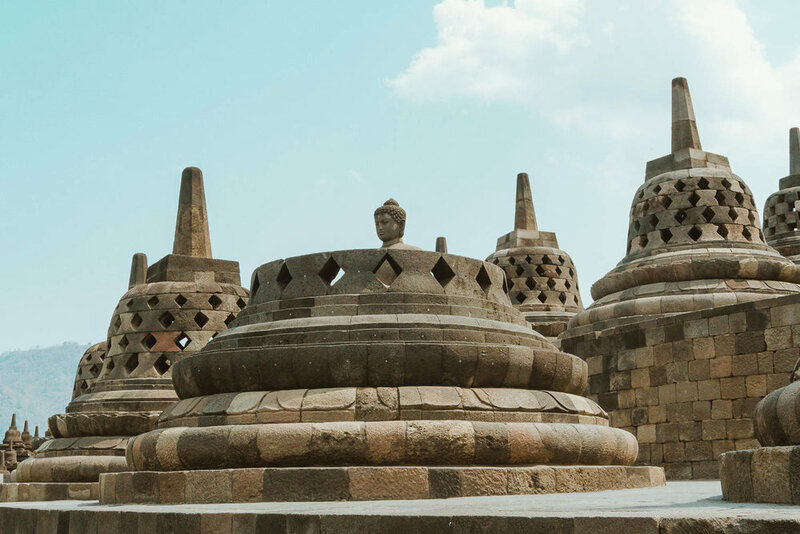 The entrance ticket costs US$ 25 (approximately 380,000 IDR) and can also be purchased together with the ticket to Borobudur temple (US$ 40 - approximately 600,000 IDR). Always have cash with you because when we were there, they were not accepting cards, only cash payment. The opening hours are from 6 am to 5 pm. Candi Sewu is another Buddhist temple and the second largest in Central Java (the first being Borobudur). Not well explored still, this temple is a place without many tourists in which you can walk through the quiet ruins. In total, there are more than 240 temples, with a larger one in the middle and the ruins of what were previously the other smaller temples. Despite being of Buddhist construction, in the architecture it is possible to find Hindu influences - a sign that these religions coexisted peacefully. 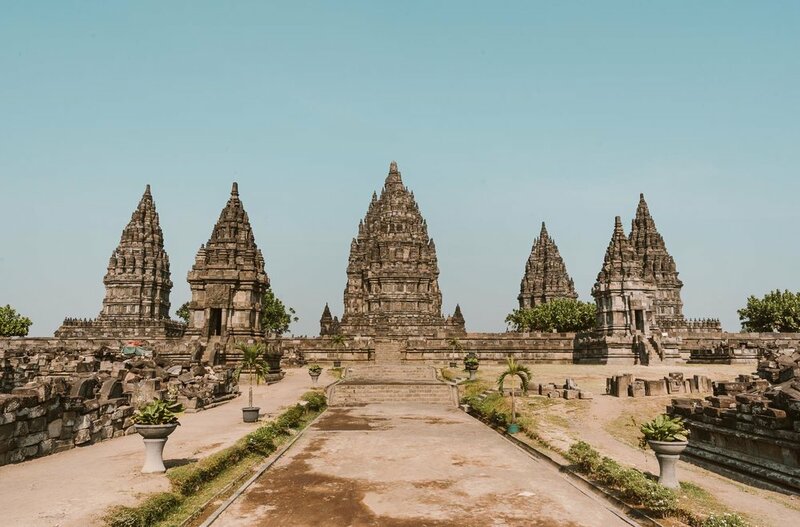 You can visit Candi Sewu after visiting Prambanan, since they are about 800 meters away from each other (as they are in the same complex, the entrance ticket allows you to see both). Follow the signs as you leave Prambanan and walk for about 15 minutes, or pay a symbolic fee to use the golf carts or bikes available to visitors. Candi Plaosan is another Buddhist temple in the area, situated about 1 kilometer away from Prambanan Temple. Here there are approximately 170 buildings, among them stupas (like those of Borobudur) and shrines, many with the statues of the Buddha. Around Plaosan you will see rice plantations, and the best way to visit it is to combine the trip with a visit to Prambanan, due to the proximity of the two. Seeing ruins like Ratu Boko in Indonesia, it is very easy to think that it is another Hindu or Buddhist temple, but in fact the place was used as a royal palace for the old Kingdom of Mataram; responsible for the construction of diverse temples in the surrounding area, including the above mentioned. Ratu Boko is a different place from what is normally seen in the country, since it reminds you of European ruins, like the Roman Forum on a smaller scale. 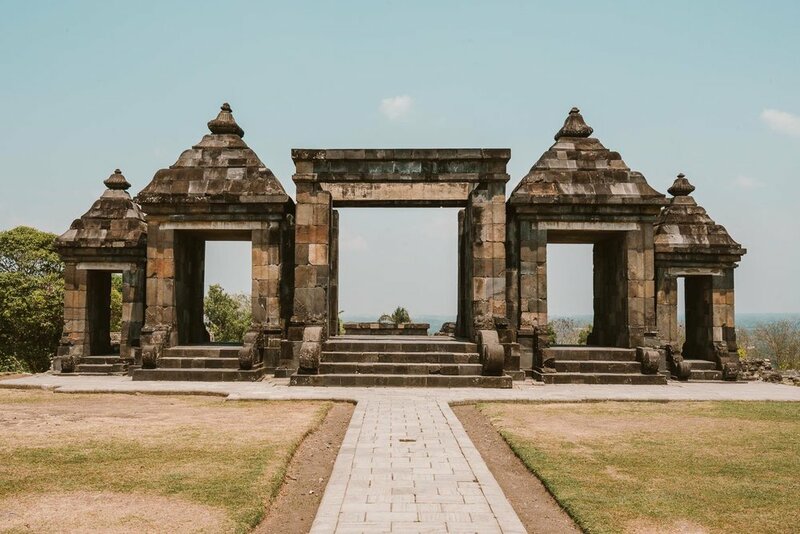 Ratu Boko is located 3 kilometers away, up the hillside, from Prambanan temple with direct views onto it, the Merapi volcano and the city of Yogyakarta. The main point to see here are the main portals, with a large central door and two smaller ones on each side. However, within the complex you will still find an area that was used for public hearings, the former princess palace, a swimming pool, a cave and a miniature temple. 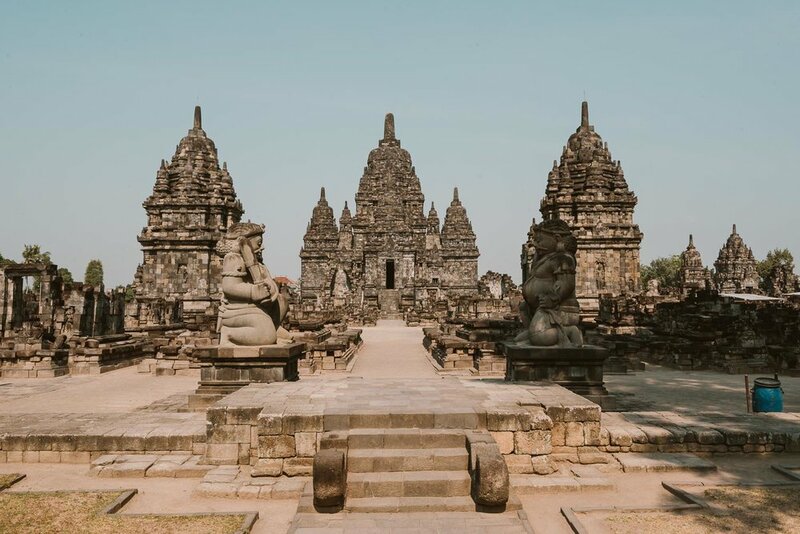 The entrance ticket costs US$ 25 (approximately 380,000 IDR) and can be purchased along with the ticket for Prambanan (US$ 40 or about 600,000 IDR, including transfer service between the two attractions). 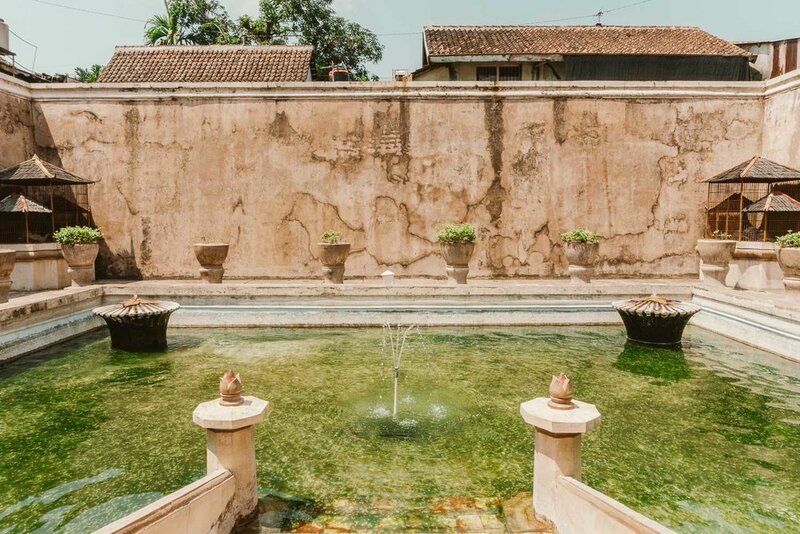 A living piece of history and tradition in Yogyakarta, Keraton is the Royal Palace of the Sultan and one of the unmissable attractions in the city. Construction of the Keraton began in the 1700s, and respecting Javanese beliefs the palace is situated in the center of the province, with the same distance between the Indian Ocean and Mount Merapi, considering their importance within Javanese culture. Today the palace remains the home of the Sultan, who is also governor of the Special Region of Yogyakarta. 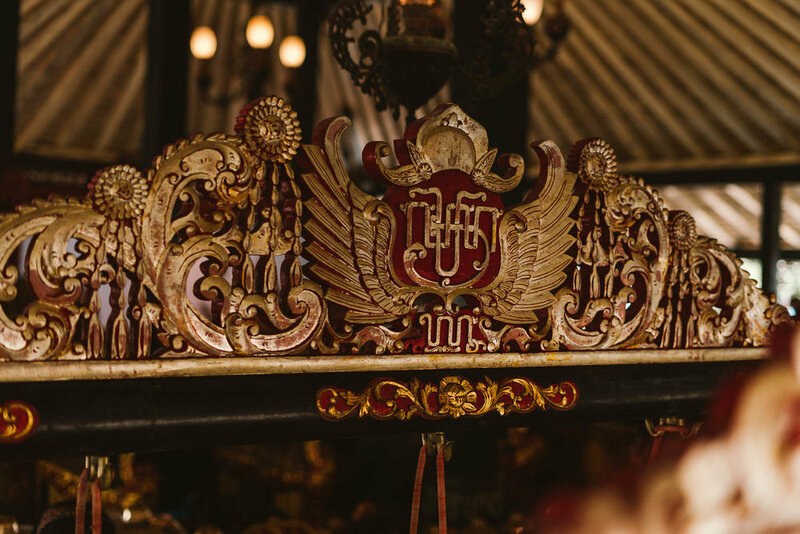 While walking through the palace grounds, you will see the Abdi Dalem, who compose the court of the royal family - this noble devotion is an honorable pride and is passed from generation to generation. 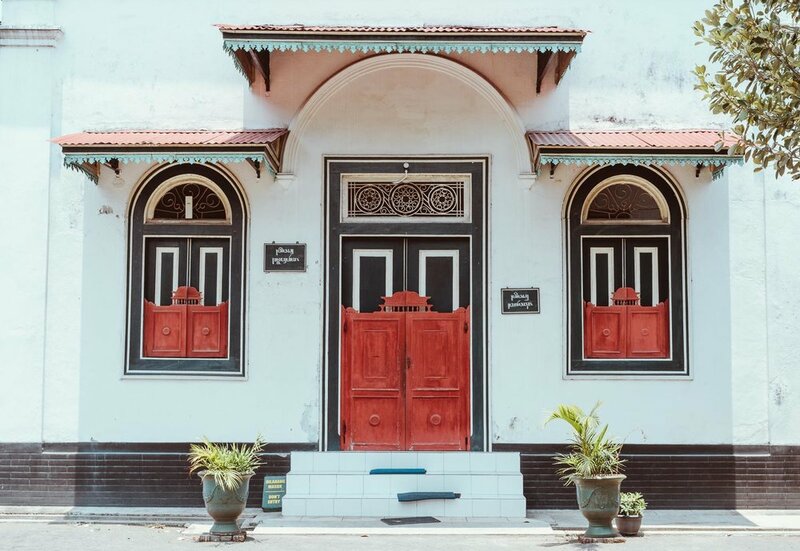 In Keraton you will also find museums, such as the one displaying the furniture of the last deceased Sultan, as well as artistic performances of music and dance. On weekends, you can watch wayang performances (puppet theater used to tell a lot of stories, with gamelan - an Indonesian percussion orchestra that can have up to 80 instruments playing at the same time). Keraton opens at 8 am and the entrance ticket can be purchased for 15,000 IDR. Before you go, check the times of the events. Taman Sari was the royal garden of the Sultan of Yogyakarta which was built in the 18th century, possibly by a Portuguese architect, as a place of rest and meditation for the Sultan. Here you can find the Water Castle, a complex with three swimming pools, where in one of them the Sultan's concubines danced while he watched from the top of the tower. Then he would throw a flower for one to pick up, and whoever was quick enough would join him in his private pool. Still inside the Taman Sari, you can visit the underground mosque Sumur Gumuling, with its stairs and entrances that interest those in love with geometric shapes and symmetry. Taman Sari is open from 9 am to 3 pm and admission costs 15,000 IDR. Similar to Taman Sari, Situs Warungboto was another resting place for the Sultan and his family. It was built with bricks without having a trace of wood in the building, and there it would be possible to find gardens and water fountains for the family to relax. Situs Warungboto is not a very popular attraction, as earthquakes have ruined it over time, but it's a great place to continue immersing yourself in Yogyakarta's culture, especially for those who want to find other things to do in the city. In addition, the attraction is an excellent place to photograph, with its colors and shapes – very attractive to photography fans. A big street market, with Indonesian food stalls, clothes and batik-filled clothing shops. You cannot miss it, even if it's just to stroll and buy batik to take back as a gift. Here are two different itinerary suggestions to spend two days in Yogyakarta. Day 1: Start at Taman Sari and Keraton in the morning and spend the afternoon, getting to know Prambanan and the nearby temples (pay attention to the time, as it closes at 5 pm). Day 2: Visit Borobudur during sunrise and after checking out the whole complex, head back to the city center and stop at Jalan Malioboro. If you wish to, head over to Situs Warungboto before the sun goes down. Day 1: Start at Taman Sari and Keraton in the morning. In the afternoon, preferably after lunch in the city, head over to Borobudur and visit the whole temple calmly. Day 2: Reserve the entire morning to visit Prambanan and the surrounding temples. In the afternoon, when returning to the center, stop at Jalan Malioboro and, if you wish to, head on over to Situs Warungboto. You can use the Grab app to get around in Yogyakarta, even to visit the farthest points of the center such as Borobudur and Prambanan. There is also the option of renting a car with driver (daily between 500,000 and 700,000 IDR). Click here to see a selection of hotels in Yogyakarta. In this post, I pulled together a summary of what to do in Yogyakarta, with the main attractions to be visited. However, if you have more time, take the opportunity to visit the Merapi volcano, the beaches, waterfalls and lookout points throughout the region. Did you like the post? Then don’t forget to save the image below on Pinterest to find it later.